The 23rd (St. Augustine’s) Scout Group was formed just before the outbreak of World War II. Although a Scout Commissioner of that time said it all began in 1938, the first record we have is a note in a Log Book saying the first Scout meeting was on 7th November 1939. Maybe the ‘Wolf’ Cubs had started a year before. The area around Southborough had developed quickly during the 1920s and 30s. St. Augustine’s Church was an offshoot of St. Luke’s just as the 23rd had been hived off from the 5th Bromley. Our first Scout Leader was our vicar, Rev. Earle, who at one time had been the Deputy Camp Chief for India which gave the Group a sound foundation. But with the commencement of the war it was difficult to maintain a thriving Group. Bombs and blackouts were no encouragement to a boy to attend regular meetings but somehow the Group survived. By 1942 both pack and troop had 25 boys. But through those early years the strength of the Group lay with its Leaders – or lack of them. However, the Group was able to produce its own Gang Show – ‘Flying High’ in 1950, and over the years pantomimes and gang shows have been a recurring feature; show business was in the blood! The Commissioners’ Standard is awarded annually for the Scout Group making the best progress and this was first gained in 1952 to be followed over the years with success at regular intervals. It is hard to write a brief history without mention of one man in particular, and that man was Bert Fisher who arrived on the scene in the early fifties. He encouraged the formation of a Group Council (now known as the Group Executive) to steer the philosophy of the Group, and the Supporters’ Association whose job was to raise sufficient funds to support the requirements of Leaders and boys. On this foundation the Group prospered so much that it was soon seeking a permanent brick built HQ of its very own. Energetic fund raising through Jumble sales, fairs and other means meant that by 1970 there were sufficient funds (including grants from various bodies) to proceed. The HQ was opened in 1973 and an extension was built, primarily for storage, in 1979. In the intervening years the 23rd had opened a third Cub Pack. This was named Kim and operated from the GEA Hall in Petts Wood. Its purpose was to serve families in the Petts Wood area of the parish. Most successful it was too, although the Leaders cast their eyes longingly at our new HQ which was opened in 1972 on the corner of Southborough Lane and Homemead Road. The 23rd have always had a strong representation at World Jamborees. 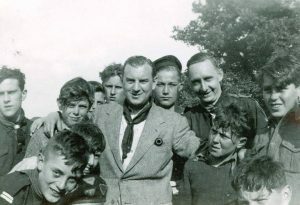 Our first successful scout to be selected went to Niagara in 1955 and from then on one or more boys have represented the Group at most Jamborees. The venues have included Idaho, Norway, Colorado, New Mexico, Alberta, and Australia. Quite a remarkable achievement. Many a summer or Whitsun camp took place over the years in the UK, perhaps Washaway in 1986 being the most appropriate name. But come rain or fine weather these camps were always the highlight of the Scouting year. A seismic shift in the Scouting Movement occurred when membership became open to girls. What is more, one of our first girls soon became a Queen Scout. The girls did not take long to settle into all branches of Scouting, the only delay being trying to get lady scouters which was a requirement where girls were involved. Another innovation which made a massive impact on our Group was the introduction of Beaver Colonies in 1986. Children between 6 and 8 years old were invited to join and as ever the only inhibition was the lack of suitable leaders. Three colonies were opened to cope with the rush! Over the years the success of the Group, and it is successful, has always depended on the quality of its Leaders and the enthusiasm of the children. Long may it continue.